The shutters available today are not just plantation shutters, rather there is a whole new world waiting for us to choose from. Referring to the design, style, colors, interiors, and materials such as Wood, Composite or Poly Shutters – the manufacturers present many options today. When shopping for shutters in Orlando, there are certain questions that you should have an answer to before investing in window shutters Orlando. Do you want custom shutters inside or outside mounted of the window opening? Let us explain the difference between the mountings, an inside mounted shutter is mounted inside the window opening. An outside mounted, the shutter is fixed to the outside of the window opening. For inside mounting, there should be enough depth inside the frame so that the shutter can be mounted securely and operated effectively. The windows can be square or arched, other shapes may also be possible upon further inspection. What size would fit the best? When ordering your shutters you want to make sure that the windows are properly measured, each plantation shutter is custom made to your window opening. In fact, it is best to call the experts at orlandoblindsandshutters.com – Gator Blinds – for free measuring. We can give you expert guidance on what works best for your windows. If your windows need custom window treatment solutions, well our experts will help you with the selection, measurement, and installation. What louver size would fit the best? With louver sizes, it is truly a personal preference. 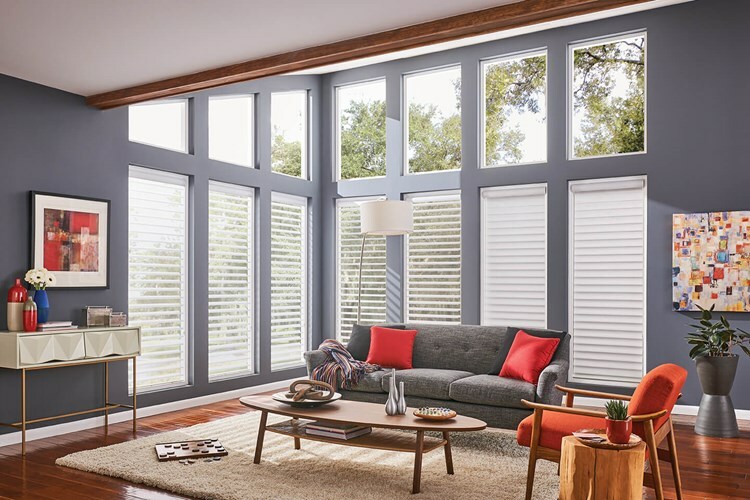 Some people think “smaller window, smaller louver slats” and “larger windows, bigger louver slats” work well, but when you want to enjoy the outer view, wider slats for shutters are recommended. Also, you want to make sure you have enough depth for the differently sized louvers so that you can operate them properly. Get connected with us to see the different louver sizes available and what should work for the window. How many shutters should I order? Well, that is a question only you can answer. Do you want to update all your windows in your home or is it just about one particular room? Since the shutters are individually made for each window, you can order them as you like. You can choose from the variety of colors and styles and not necessarily have the same in every room. The answer to this depends on the location. Poly shutters are undoubtedly less expensive and the best for Insulating factors, UV, moisture and humidity resistants, strength and rigidity, they also work great in high moisture areas like bathrooms and kitchens. Wood Shutters need more maintenance like repainting or staining over the years but the beauty of our poly wood shutters orlando with stained colors is incredible. You have to look at the purpose you want the shutters to serve and then make your choice accordingly. Our AluCore Poly Shutters are simply the best, the Poly Shutters have an Aluminum Core in the Stiles and Louvers which makes this shutter arrow straight. When it comes to offering style and functionality the AluCore Poly Shutters do not disappoint. How much do the shutters cost? Shutters are an expensive investment for sure, but every bit is worth given the fact they are highly functional and bring in a visual element to the entire house. The cost depends on various factors such as – square standard size or custom made arches, material – wood, Poly, faux wood, vinyl shutters – the options are many. Weigh the pros and cons and take into account the budget for making an informed decision. So, here are some questions that we have tried to find the answer to and to help you find the best window treatment for your windows. If you have any other questions about Shutters, please don’t hesitate to contact us and ask your Shutters Experts – Gator Blinds LLC.